September 2008: Image processing firm Anthropics Technology, will be demonstrating the latest release of its new automatic photo editing and airbrushing software, Portrait Professional V8 at photokina (http://www.portraitprofessional.com). To obtain a 10% discount on this software inlcuding the new Studio edition, enter Master Photo Digital magazine special code mpa609; if you have bought an earlier edition, use code ‘mcpupgrade‘ to secure a discount on an upgrade. Portrait Professional is the world’s first intelligent portrait airbrushing software that has been “trained” in human beauty. By statistical analysis of hundreds of photographs of faces, the software has learnt the features that are attractive and unattractive in human faces giving it a built in understanding of human beauty. This understanding means that for any given portrait the software actually creates custom controls specifically to enhance that particular face. The software contains over 80 beautifying controls to give the user fine control over the appearance of the face and hair. Because of its innate knowledge of human appearance, Portrait Professional 8 requires far less skill and time than traditional touch-up software. After a simple “mark up” stage, users can enhance many aspects of the portrait photographs instantly, simply by moving sliders. 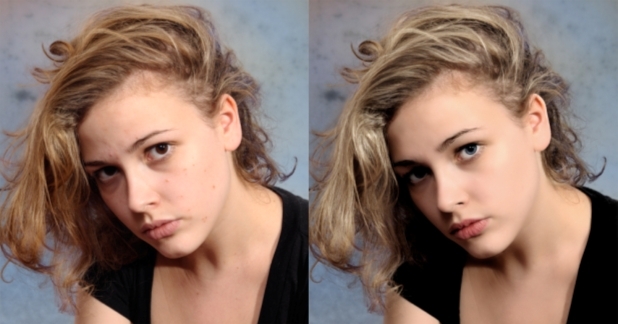 So now, for the first time literally anybody can perform professional quality touch-up on human images in photographs, and at an eminently affordable price. The latest version of the software has been enhanced by further training in human appearance, particularly on the 3/4 views, in order to achieve the most realistic results so far. In response to feedback from fashion, advertising and catalogue photographers it also includes further shape beautification modes, such as neck lengthening. Following the addition of new hair, eye and mouth beautifying controls, Portrait Professional 8 is also the only software in existence which enables automatic hair recolouring, hair thickening and hair smoothing at the editing stage. It also has similar enhancements for eyes and mouths. Iris colour, iris saturation, whiteness of the eye, pupil colour, and the sharpness and size of each eye can be individually controlled by sliders. Whiteness of the teeth, the colour contrast saturation and darkness of the lips and the sharpness of the overall mouth can be adjusted in the same manner. The software is available in two versions: Portrait Professional 8, the standard version which works with Jpeg and Tiff files (priced at £39.95 or US $79.95), and Portrait Professional 8 Studio, the high end version which also works directly on 16 bit Camera RAW files (priced at £59.95 or US $119.95). You can obtain an on-line 10% discount by entering the code mpa609. Anthropics’ CEO Andrew Berend said: “Whereas in the past, it would have taken a highly skilled user several hours to produce a quality finished, digitally enhanced image, it is now possible in less than ten minutes. Portrait photographs are by far the most common images produced by amateurs and professionals and we are delighted to be able to offer the world’s first intelligent portrait enhancement software to speed up and simplify complex touch up. In response to the feedback of numerous enthusiast and professional photographers, we have designed this version of Portrait Professional to be completely Mac compatible. In addition, following extensive user testing, the software’s interface, as well as the Help and Tutorial Systems have been significantly enhanced to improve ease of use. Higher end enthusiast and professional users require absolute control of the colour of their images. To facilitate this, the higher end version of the software, Portrait Professional Studio, which works with camera RAW files, is now also fully colour aware, such that any embedded colour profile is used in all stages of the processing, as are calibrated colour monitor profiles. In addition, the 16 bit RAW file format support has also been significantly extended. This entry was posted in News, Press Releases, Uncategorized and tagged Portrait Professional, retouch, software by publisher. Bookmark the permalink.